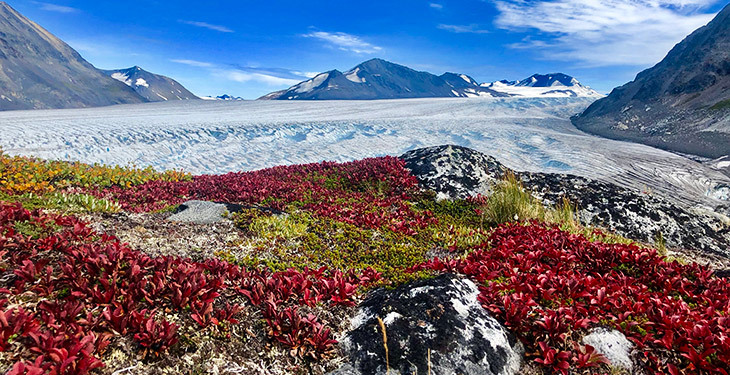 Discover the unparalleled beauty of Alaska's backcountry in the Kenai National Wildlife Refuge. Experience the raw Alaskan backcountry & be amazed by breathtaking scenery on this Kenai Mountains Base Camp adventure. 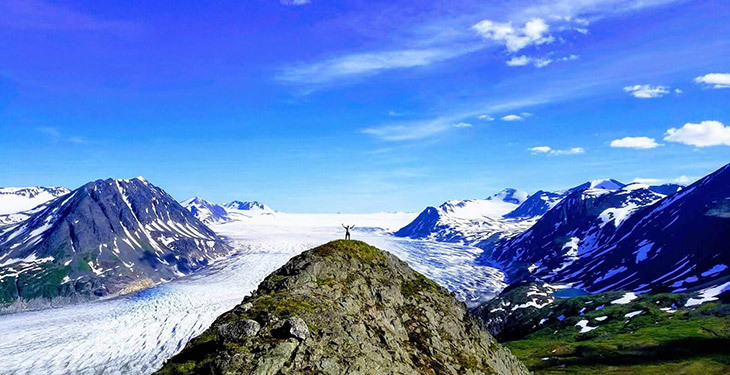 Embark on an Alaskan adventure through the Kenai National Wildlife Refuge. This 5-day base camp experience takes place completely off-trail in the backcountry of the Kenai Mountains. You'll have daily hiking adventures along alpine lakes and through pristine mountain wilderness. As you make non-technical ascents of mountain peaks, you'll be awe-struck by the incredible views of the Kenai Mountains. 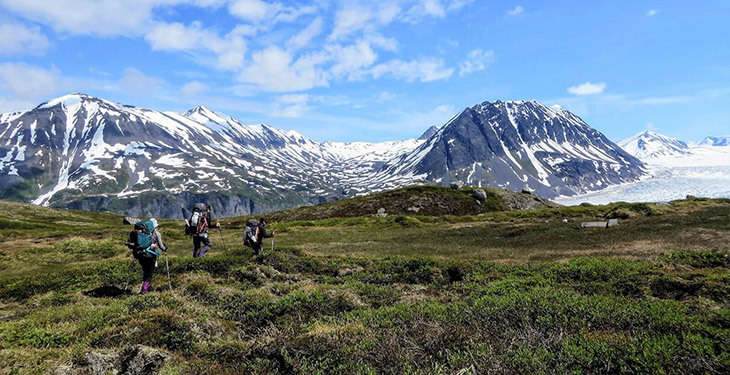 This is a great trip for new or seasoned adventurers to hike and climb in Alaska's trail-less wilderness with a real, immersive backcountry experience. This trip is complete with round-trip Alaska Railroad train transportation, and floatplane flights to and from the backcountry, it will also provide you with the opportunity to see rarely visited areas of the Kenai Peninsula. Plan to fly into the Anchorage International Airport (ANC) the day before your trip departure as you'll need to board the train by 6:15 am on day 1. Kenai Backcountry Adventures can assist you with booking your accommodations in Anchorage. Start the day early and board the mighty Alaska Railroad for a magnificent train ride to Seward. Your KBA Guides will greet you at the train depot and then you’ll be on your way to KBA's flight office in Kenai. 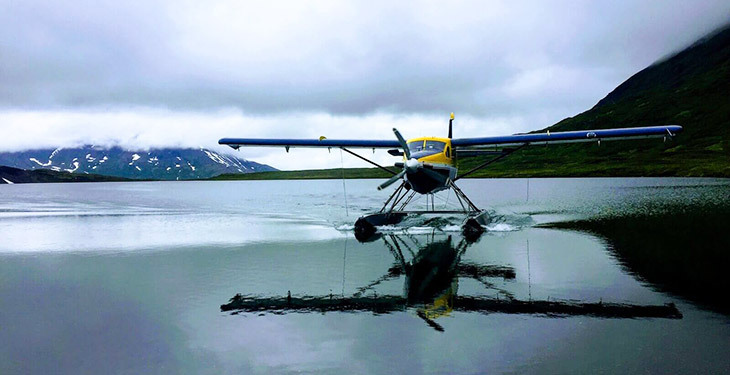 You’ll experience a 30 minute floatplane flight deep into the Kenai Mountains. Once you set foot back on land, you’ll set up the base camp and enjoy a delicious backcountry meal and an evening hike. Spend your days exploring the Kenai Mountains and the massive alpine landscape that surrounds you. You’ll have endless route options for your daily hiking adventures which will include Alpine hiking, peak bagging, wildlife viewing, and much more! The routes will venture into the furthest backcountry areas in this part of the Kenai Peninsula. Enjoy base camp near a gorgeous alpine lake where the remoteness and utter beauty of all that surrounds you will leave you feeling blissful and ready for each day’s challenges. After a morning of exploring and trekking, the group will gather lakeside for your floatplane pick-up. The flight is exhilarating and you’ll get a bird’s eye view of the massive landscape which you’ve just trekked. This will really put your accomplishments into perspective. Once back to the floatplane base, you’ll hit the road for the beautiful drive back to Seward, arriving around 4:00 pm. Your KBA guides will drop you off at the Alaska Railroad train depot, for you return journey back to Anchorage, arriving in Anchorage at 10:15 pm. If you are returning home this evening, please be sure to schedule your return flight for after 2:00 am the following day. 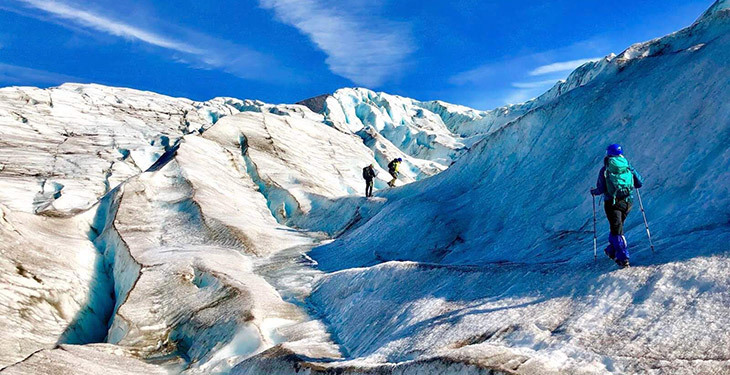 Kenai Backcountry Adventures’ professionally guided wilderness adventure tours will take you into the most breathtaking backcountry areas Alaska has to offer. From national parks to wildlife refuges, mountain peaks to majestic rivers, their groups are small, and the adventures are BIG! 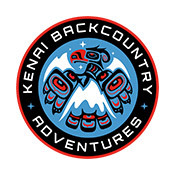 Kenai Backcountry Adventures specializes in purveying a true backcountry adventure in Alaska. Every person at KBA is a current Alaska resident who has spent years living, working, and exploring in Alaska. Their focus means every guide knows these destinations intimately, and that comes through in the thoughtful planning of your trip. Each journey is “tailor-made” by knowledgeable adventure specialists to match your interests and timing, with no big tour groups or tour buses. With KBA, you’ll experience more of the best backcountry that Alaska has to offer. My husband & I went out on a day boating/hiking trip. When I made the reservation, I told KBA that birding was my hobby and if we could fit a little birdwatching into the day I would be so happy. Not only did they fit it in, the guides tailored the trip just for our interests, hanging close to the shoreline and exploring every cove for shore birds and waterfowl. We stopped at the mouth of Hidden Creek for a 3 mile easy hike and checked out song birds and woodpeckers before lunch. In all, we found 23 species of birds, to include a flock of 7 Surf Scoters, 5 Common Loons, both Red-throated and Common Mergansers with babies hopping on and off their mothers back as she swam along. Bald Eagles were everywhere! The scenery was so beautiful on Skilak Lake. 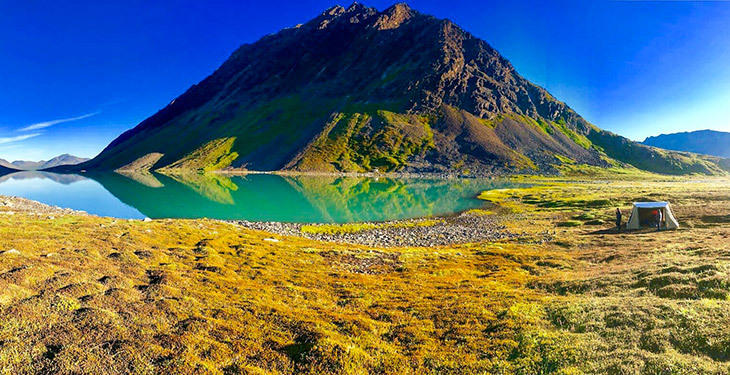 Had we not taken this tour with Kenai Backcountry Adventures we would have missed out on the majesty of this area of the Kenai Peninsula. Oh, I forgot the bonus - on the road to where we were to meet the guides, we came upon a Mother Black Bear with not one, not two but THREE CUBS, peacefully eating leaves and grass on the side of the road. Again, the area that KBA shows it's clients is spectacular for many reasons, the beautiful scenery, the wildlife and birds, and the excellent customer service! The guides were professional about every aspect of the trip. Kyle, kudos for running such a first class operation. My husband was so impressed with your boat - clean as a whistle, looked brand new and every piece of equipment was top notch. You guys ROCK! I needed someone who could arrange a visit to the Valley of 10,000 Smokes inside Katmai National Park, which is so logistically complicated that only a couple of hundred people manage to do it each year despite the area's extraordinary beauty. Kyle came up with three solid proposals to maximize my limited time. (As Kyle likes to say, "I always have a Plan A, a Plan B and a Plan C"). Everything went off smoothly, we had a great time and Kyle even managed to squeeze us out a little early at the last second when a major storm suddenly appeared out of nowhere that would have left us trapped for days (and me in a major pickle). Highly recommended. Kenai Backcountry Adventure was amazing. We had the luxury of only having two people with us, thus we got to choose what we wanted to spend the day doing. We choose to stick with easy trails. Skilake Lake is so beautiful and the guides do a fantastic job of truly showing you all this area has to offer. I would 100% recommend doing this! There is a minimum of 2 people required per departure date. Please do not make travel arrangements until you have received confirmation from Kenai Backcountry Adventures. This trip has a minimum of 2 people required per departure. Please do not make travel arrangements until you have received confirmation from Kenai Backcountry Adventures. What is the best way to get to Anchorage? It’s best to plan a buffer day at the end of the trip in the event of a weather delay departing the backcountry on the last day, however if you must make flight arrangements to depart Anchorage on the last day of the itinerary, please make your flight departure for after 2:00 am the following day. Accommodations are double occupancy base camp tent camping in the backcountry. Can solo travelers get their own tent? Is there a a single supplement fee? If you would like your own tent, a single supplement of $150 per person applies to tent camping Days 1 – 5. This is an active trip requiring physical conditioning and consistent exercise prior to the trip. Pre-trip physical conditioning should begin 2-3 months before departure and should include walking or hiking, or other cardio activity such as high intensity interval training. Proper nutrition in the backcountry is paramount for stamina and recovery. KBA creates gourmet masterpieces from scratch that are healthy, filling, and delicious leaving your palate (and belly!) satisfied. Everything from cinnamon rolls and vanilla pancakes for breakfast, to spaghetti with meatballs for dinner, finished off with cheesecake for dessert. Kenai Backcountry Adventures recommends that you bring $500 cash for gratuities, in-town spending money, souvenirs, additional meals, etc. A detailed base camp gear list will be provided with your booking confirmation. Are bears and other wildlife going to be a problem? Bears are virtually everywhere in Alaska, and therefore one should anticipate and be prepared for a possible encounter or sighting of a bear. Moose are a common sighting on the Kenai Peninsula but generally keep their distance. Kenai Backcountry Adventures takes wildlife safety very seriously and therefore take precautions to keep you safe in the wilderness. In addition, you'll learn the necessary safety procedures regarding Alaska wildlife in your pre-backcountry safety orientation. The most common bugs are mosquitoes and no-see-ums. However, based on the time of year and current weather conditions insects may or may not present an issue. Generally, there are only a few areas where tours tend to encounter mosquitoes along the route. Come prepared with insect repellent and a high quality head net. Weather in this part of Alaska is highly variable and unpredictable. It could be in the 70s or 80s one day and in the 50s and raining the next (or in the same day!). You may encounter snow at higher elevations. High winds can be frequent and may impede travel at times. Travel insurance is required for this adventure. It allows you to seek reimbursement if you are forced to cancel your trip for unforeseeable reasons, or if you need to cover medical help, emergency transport, and/or theft or accidental damage while traveling. We recommend World Nomads as a travel insurance provider. Book confidently with Free Cancellations within 72 hours of booking. After 72 hours, cancellation fees will apply. Cancellations are subject to the full discretion of Kenai Backcountry Adventures. For more information on our Travel Cancellation Policy please Click Here.